The specific sexiness of N8 is on the anodized aluminium casing against a stainless steel back cover of N97 which is on a comfy plastic detail with shiny bezel. 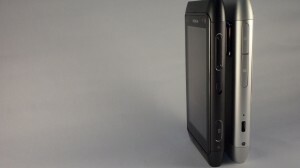 Akin to N8 is the Nokia E52 which also have been designed with metal accent and a stainless cover at the back. You’re only task, people, is to whether tell us on which do you prefer, a Silver White Nokia N8 or Dark Grey N8 or a White N97 mini or an E52 that is on grey. You are free to use all the images above as long as you don’t claim as your own and please do give credits to me or to SymbianWorld. 😀 Thanks. You’ll definitely love the nate when you have it.